Bad valve seat workmanship stands out like a sore thumb if you know what to look for. The first think to look for is the alignment between the seat and the guide. Are they concentric? In other words do they have a common center? In our picture below notice that the center of the circle formed by the seat is not centered to the circle formed by the guide. The circles are eccentric. What I'm looking at is the thickness of the top of the seat at the black lines. Notice the width is thicker on the right side than on the left side. Of course a face must be ground into the seat before you can check concentricity. What happened here is that the seat grinder pilots from the guide so it wants to align itself to the guide center. This causes the grinding stone to grind more on to the left in this picture. If the seat and guide were concentric then the seat grinder would grind dead-center and there would be equal widths. The practical effect here is that the stone pressure is mostly on the left where it is doing most of the grinding. Now drop a valve onto this seat. Just like the grinder, most of the seat contact pressure will also be on the left side. 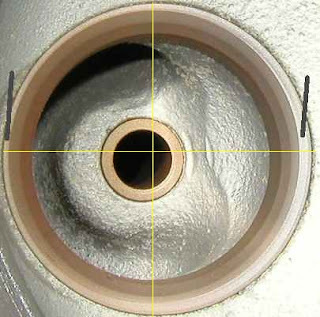 In analyzing eccentric seats in aircraft engines we found that they develop exhaust valve leaks at the narrow side. This makes sense as the narrow side is where the least amount of contact pressure occurs. Also, the valve is slightly tilted to one side. I would also presume that guide wear would be accelerated as the valve stem pushes into the side of the guide as the valve attempts to center itself onto the seat. No fancy 3 angle valve job is going to correct this seat. What do you do about it? The only think you can do is move the holes back into alignment. This requires fixtures and cutters and cannot be done with hand tools. Also, to move a hole one must make it larger. You come up against maximum oversize limits quickly when you start moving holes. "You come up against maximum oversize limits quickly when you start moving holes." So don't let idiots with poor equipment ruin your parts, or your day. Thanks for this post. I got a lot of idea in mechanism. Now I am applying in this Qualified Mechanic Jobs in Thomastown Victoria and I was waiting for an interview. You can also apply on that company because they are still hiring.